ANOTHER DAY, another study showing terrible news for the climate. There is a danger that scientists’ findings are coming so often and sounding so dire that even thoughtful observers will tire of being alarmed. But alarm is the only reasonable reaction. Last week began with the news that greenhouse gas emissions from the United States shot up 3.4 percent last year, a rattling reversal from recent years. Republicans who favor doing little to nothing on climate change often argue that U.S. emissions have been declining without more federal intervention. But it is fantasy to imagine that the pace of decline, let alone the even more aggressive rate of change the world needs, is sustainable without government action. The nation must adopt policies such as a carbon tax that would encourage economic growth without emissions growth. Also last week, the journal Science published a study finding that the oceans are warming at a terrifying pace, 40 to 50 percent faster than the United Nations had previously estimated. The world’s waters soak up nearly all the extra heat humans help add to the Earth’s energy balance, and the consequences will include more massive coral die-offs, depleted fisheries, sea-level rise, flooding, mega-storms that pack more power and rain, and less oxygen in the ocean that undersea creatures need to live. Already, a fifth of the world’s corals have died in the past three years, a harbinger of the changes to come. As one of many Republican congressmen who just packed up their offices to make way for the Democratic majority, I’ve had time to reflect on what went wrong for the party. There are seismic political shifts under way on issues ranging from climate change to immigration to gun violence. If Republicans don’t adapt by offering meaningful solutions, the midterm losses could be only the beginning. 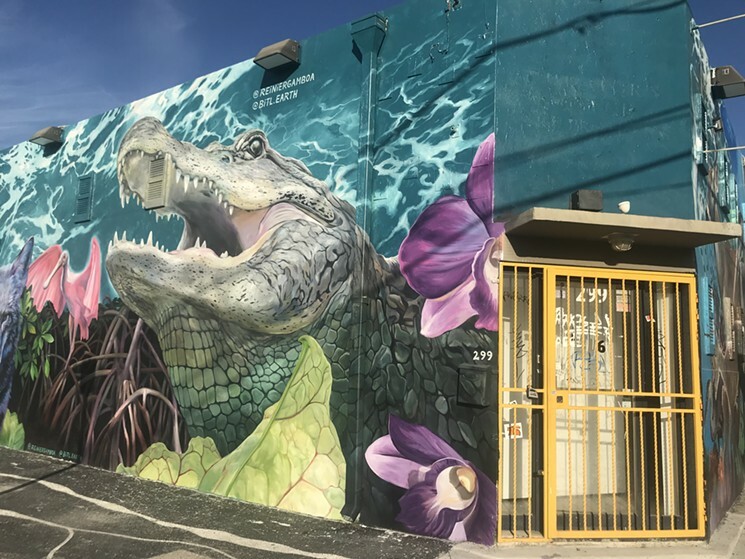 Walk down NW Third Avenue and 25th Street in Wynwood and you’ll be greeted by an alligator, a coyote, a manatee, and more than a dozen other examples of Florida’s dwindling biodiversity. The colorful wildlife makes up one of the scores of new murals that appeared in Wynwood this past December. But there’s a lot more to this painting than meets the eye. The mural uses augmented reality technology. In a few short weeks, passersby will be able to hold their phones up to any animal in the mural and see a short video using a soon-to-be-released app called the Anthropocene Extinction. There will be a video for each animal in the mural featuring music and narration that tells about the sixth mass extinction event, which some scientists say is happening right now and is mainly the result of human activity.